These two beautiful ducks can be found in the same areas, and at a distance, or in poor light on their own, can be confusing. 1 – Size. If you can see them together, this makes it an easy ID. 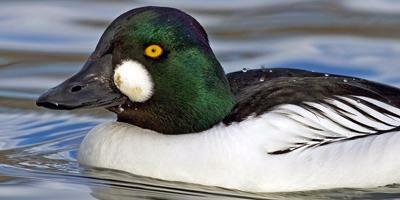 Buffleheads are small and Goldeneye are medium sized ducks. 2 – Check for the shocks of white. Both birds at a distance have a bright white chest and sides, but Common Goldeneye have a round spot just behind the bill, and Buffleheads have a large patch on the back of their heads which is more visible if you are far away than the small spot on Common Goldeneyes. 3 – Watch behavior. 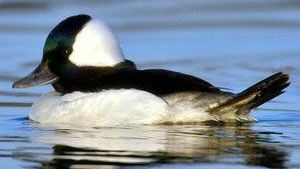 Buffleheads are like little corks in the water. They dive frequently and pop up – sometimes springing into and out of the water. They are stiff-tailed ducks so they use these tails to propel them up and into the water. Common Goldeneye however, while they spend a lot of time under the water, seem far less enthusiastic about their diving than Buffleheads. Take a moment to look for these three things, and you can make a quick ID!